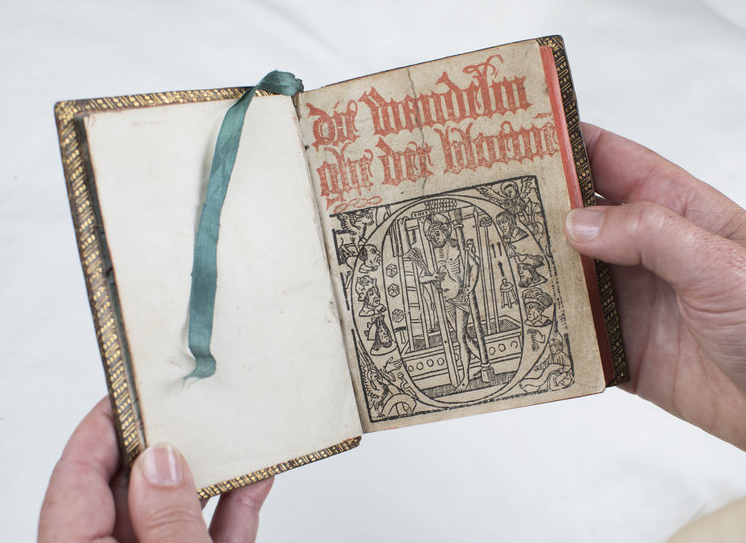 On 4 September 1518 a book was printed for the first time in The Hague: Die wandelinghe der bloemen. Only one copy has survived. The history of that (small) book and its printer, Hugo Jansz. Van Woerden, and much more, is presented by the House of the Book in thirty stories. Stories about the important role of the book in The Hague. By means of documents, books, engravings, photographs and filmed interviews, the visitor is led through five centuries of book culture in The Hague with its famous printers, publishers, collectors, book sellers and designers. Visitors to the exhibition can contribute their own memories on a map of The Hague. The exhibition starts with manuscripts from cloisters in The Hague and the famous Visboek by Adriaen Coenen of 1579. Prints of the Ridderzaal show that there were bookstalls there from the end of the late sixteenth century. Attention is also given to famous collectors in The Hague, such as father and son Meerman, the House of Orange and the Baron van Westreenen whose book collections eventually formed the basis of the Royal Library and Museum Meermanno. Master printer Jean François van Royen, who lived and worked on the Van Boetzelaerlaan, was the founder of the first Dutch private press. Visitors can see his press and print something themselves on a hand press. Photographs and other documents serve as reminders of the book shops that used to be on the Noordeinde, including that of the gentleman publisher and book dealer L.J.C. Boucher. In 1750 Hendrik Scheurleer opened the first circulating library in the Netherlands. The Ladies Lending Library founded in 1894 by wealthy women eventually came to be located on the Nassauplein. Not many residents of The Hague realize that the public library in their city was originally a private initiative of the newspaper Het Vaderland and that the first location was a couple of backrooms on the Prinsegracht. Via the Toussaintkade and the Bilderdijkstraat, it finally ended up on the Spui. The exhibition is not only to be seen at the museum. Between 13 August and 24 September in the Atrium of the City Hall, The Hague City Archive, in cooperation with House of the Book | Museum Meermanno, will display the highpoints of the history of the book in The Hague. This exhibition of the House of the Book, a cooperative venture between the KB | National Library of the Netherlands and Museum Meermanno, has been made possible with the collaboration of The Hague City Archive, the Department of Archaeology and Environmental Education of The Hague, the Supreme Council of Nobility and the Leiden University Library. With thanks to the Friends of Museum Meermanno Foundation.